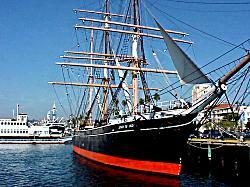 The world's oldest active iron-hull sailing ship, the Star of India was built in 1863 in the Isle of Man. 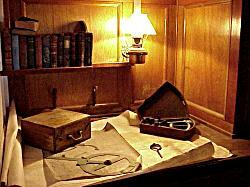 Life aboard any ship is dangerous, and the Star of India has had her share of misfortunes. Ghosts of several unfortunate sailors and passengers still haunt the decks and cabins. In 1884 a young stowaway still in his teens by the name of John Campbell was discovered and put to work. One day soon after, Campbell lost his footing high in the rigging and fell 100 feet to the deck, crushing both legs. He survived three more days before he died and was buried at sea. Visitors sometimes report feeling a cold hand touching them when near the mast where Campbell fell. Sometimes the smell of fresh-baked bread seems to come from the ship's galley, though the stove has been cold for many years. 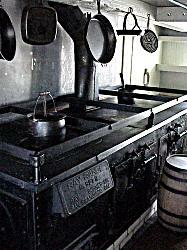 Even when the ship sits still in the water, pots and pans above the stove have been seen to move. 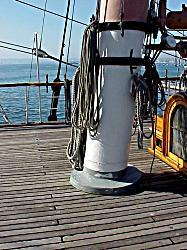 A cold spot is often felt near the chain locker located toward the bow of the ship. 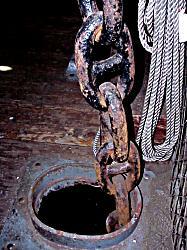 The heavy anchor chain goes below the deck into a dark storage area. A Chinese crewman was in the locker at one time when he shouldn't have been. Preparing to start a sea voyage requires several sailors pushing on wooden bars set into a capstan to raise the anchor and stow the anchor chain. No one knew their crewmate was in the chain locker below. 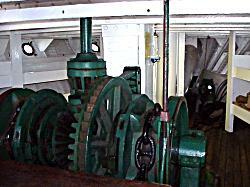 The noisy machinery brought up the anchor and fed the iron chain into the compartment below. Not hearing the screams of the trapped victim, the crew continued to haul in the anchor while the chain slowly crushed the hapless man. 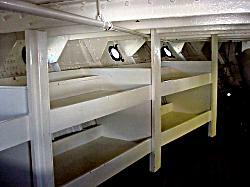 The crew's quarters were often the scene of deaths. Crewman taken below after horrible accidents or stricken by illness spent their last days here. In these tight spaces you can feel the cold and sense the fear that still haunts the ship. Not all of the places on the ship are as dreary. 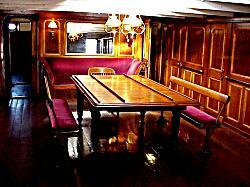 The captain's quarters are warm and will outfitted. 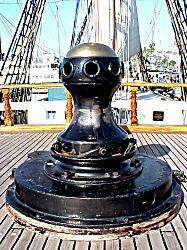 When you visit the Star of India you see many of the maps and navigation instruments that were used at the time. 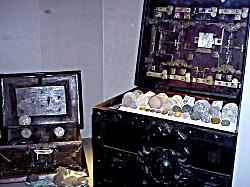 A museum of old sailing ship artifacts includes a display of treasure coins. It is not known if any violence occurred aboard the ship as a result of disputes of ownership of any such treasure, but is interesting to think of who may have once owned some of it. 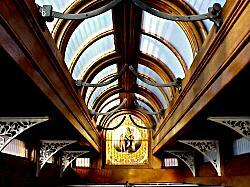 The dining salon also served as the only place high-paying passengers could keep out of the wind and rain aboard the ship while they were not in their tiny cabins. A glass and brass skylight above the dining table helps bring light below to an otherwise dark and windowless compartment. When sailing in the tropics, this also provided much needed fresh air. GoThere and GoThere.com are service marks of GoThere Corporation. All other uses are strictly prohibited..